The ‘trustworthy handaxe theory’ is explained in an article in World Archaeology and contrasts sharply with previous claims that finely crafted handaxes were about competition between males and sexual selection. Dr Spikins said: “Since their first recovery, the appealing form of handaxes and the difficulty of their manufacture have inspired much interest into the possible ‘meaning’ of these artefacts. Much of the debate has centred on claims that the attention to symmetrical form and the demonstration of skill would have played a key role in sexual selection, as they would have helped attract a mate eager to take advantage of a clear signal of advantageous genes. “However, I propose that attention to form is much more about decisions about who to trust; that it can be seen as a gesture of goodwill or trustworthiness to others. The attention to detail is about showing an ability to care about the final form, and by extension, people too. 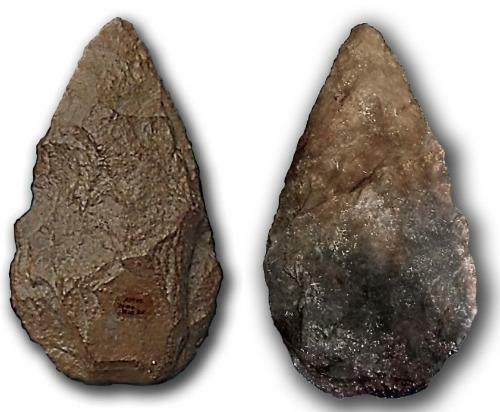 Handaxes, or bifaces, appeared around 1.7 million years ago in Africa and spread throughout the occupied world of Africa, Europe and western Asia, functioning primarily as butchery implements. 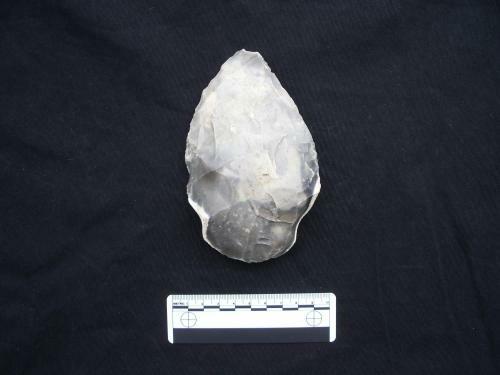 Handaxe form remained remarkably similar for more than a million years. Dr Spikins said: “Trust is essential to all our relationships today, and we see the very beginnings of the building blocks of trust in other apes. The implication that it was an instinct towards trust which shaped the face of stone tool manufacture is particularly significant to our understanding of Lower Palaeolithic societies. It sets a challenge for research into how our emotions, rather than our complex thinking skills, made us human. Dr Spikins points to other higher primates, particularly chimpanzees, as well as modern human hunter-gatherers to back up her theory of trustworthiness. “Long-term altruistic alliances in both chimpanzees and humans are forged by many small unconscious gestures of goodwill, or acts of altruism, such as soothing those in distress or sharing food,” said Dr Spikins. “As signals of trustworthiness, these contribute to one’s reputation, and in hunter-gatherers reputation can be the key to survival, with the most trustworthy hunters being looked after most willingly by the others when they are ill or elderly.